New & Improved Majella Home Cooking Coming Soon…. 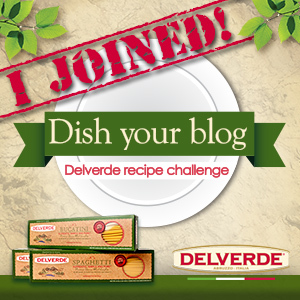 A few months ago, my friend, the wildly talented food blogger, Adri Barr Crocetti, sent me the link for Delverde’s “Dish Your Blog” recipe challenge. 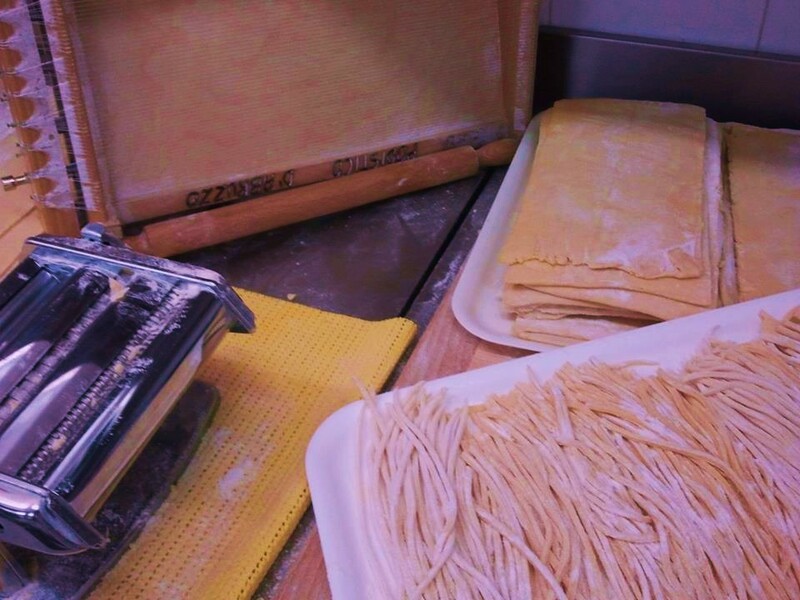 The artisanal pasta company is based in Fara San Martino, on the other side of the Majella mountain from my village of Salle. Delverde has been my preferred pasta brand for years and I commonly see packages of Delverde pasta lining the pantry shelves of my discerning neighbors in Abruzzo as well. 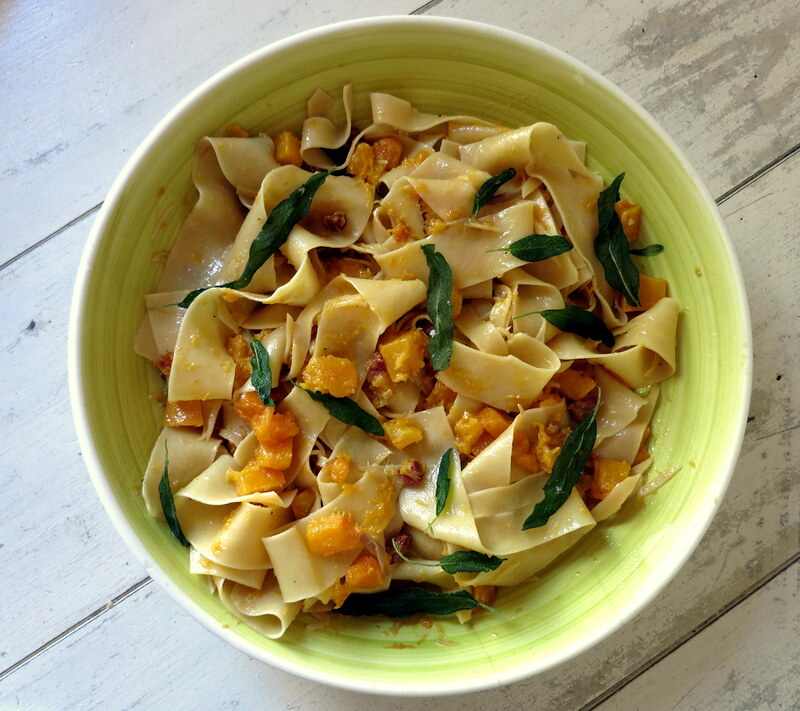 Inspired by a pasta dish I enjoyed in Florence this past summer, I selected Delverde’s Pappardelle Nests and paired the wide pasta ribbons with a condimento of sweet roasted butternut squash, salty pancetta, sautéed shallots and fresh sage. 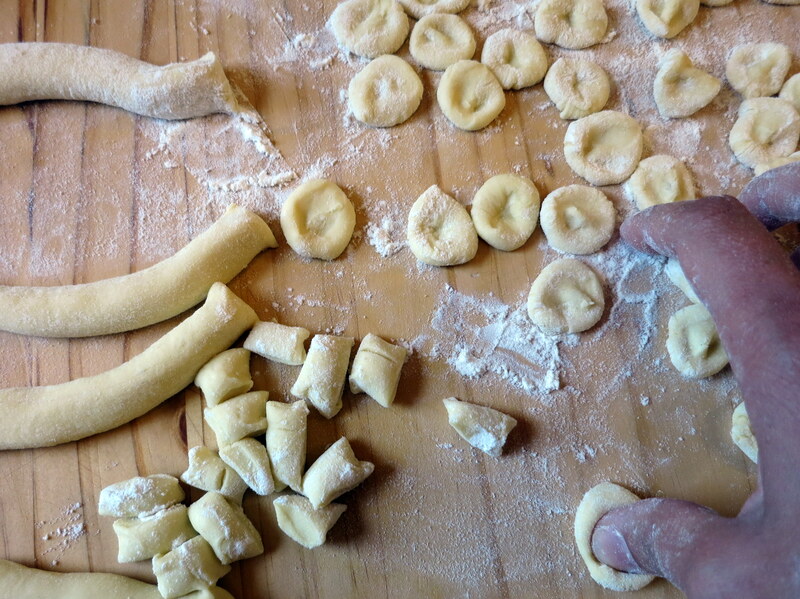 I finished the dish with a little trick I learned from a trattoria on the Oltrarno – a dollop of mascarpone. The Italian cream cheese gently marries the sauce to the pasta without the weightiness or “milky” taste of heavy cream. It’s a lovely and luscious homage to fall flavors and would work equally well with Delverde’s Rigatoni or Mezzi Rigatoni. Buon appetito! Preheat the oven to 425°. On a medium, rimmed baking sheet lined with a silicone liner or parchment paper, toss the squash with 1 tablespoon of the olive oil and a teaspoon of salt. Roast for 15-20 minutes, tossing once, until lightly browned and tender. 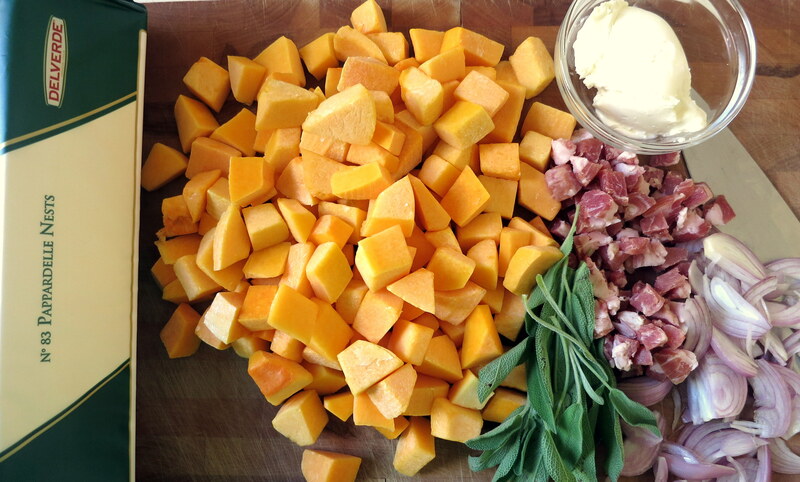 While the butternut squash is roasting, bring a large pot of salted water to a boil. At the same time, in a large skillet over moderate heat, add 2 tablespoons of olive oil and heat until the oil is shimmering. Add the sage leaves and fry until crisp, about 20 seconds. 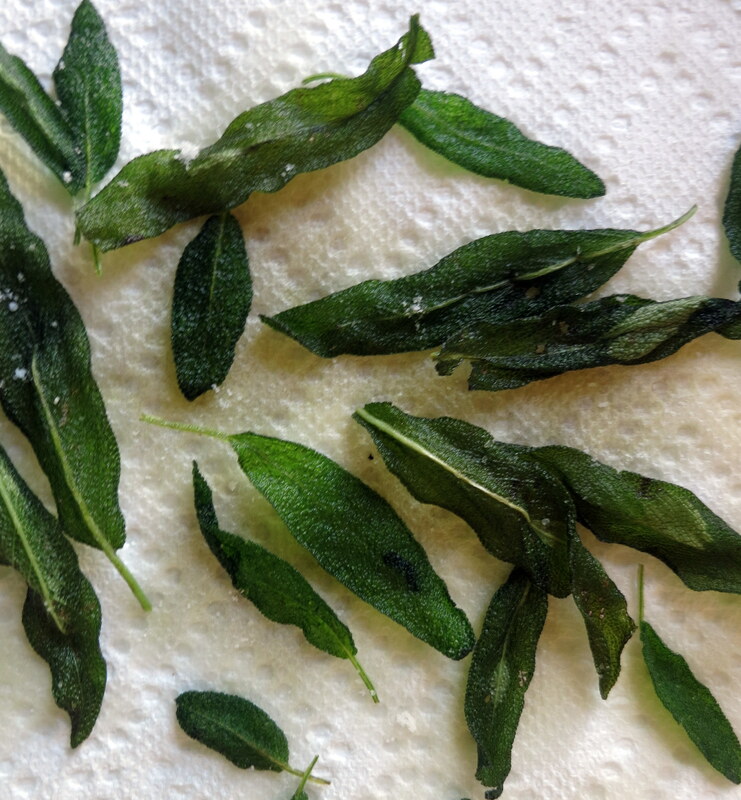 Gently transfer the sage leaves with a fork to a plate lined with paper towels, sprinkle with sea salt and set aside. To the skillet, add the pancetta and cook over moderate heat until lightly browned, stirring often, about 3 minutes. With a slotted spoon, remove the pancetta from the skillet and set aside. (Doing so will prevent the pancetta from becoming too chewy.) Next, add the shallots, ½ teaspoon of salt and several grindings of black pepper to the skillet and cook until the shallots are soft and caramelized, stirring often, about 4 minutes. 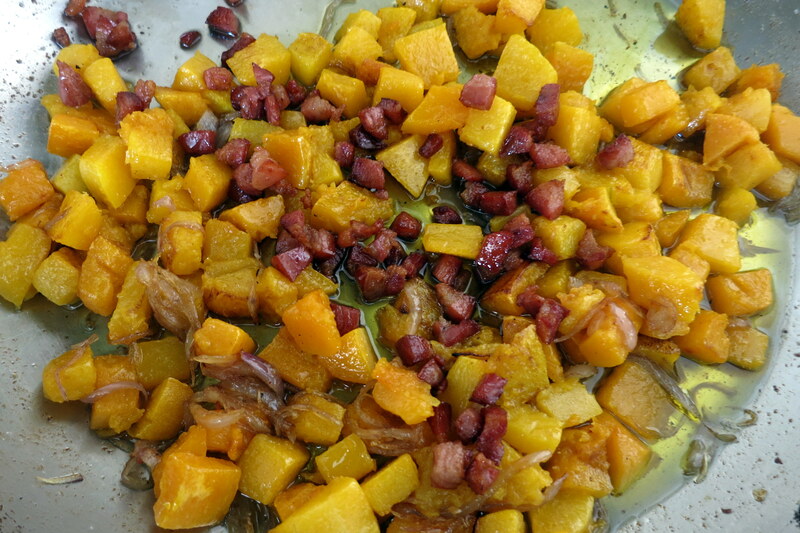 Turn off the heat and add the reserved pancetta and roasted squash to the skillet and set aside while you cook the pasta. 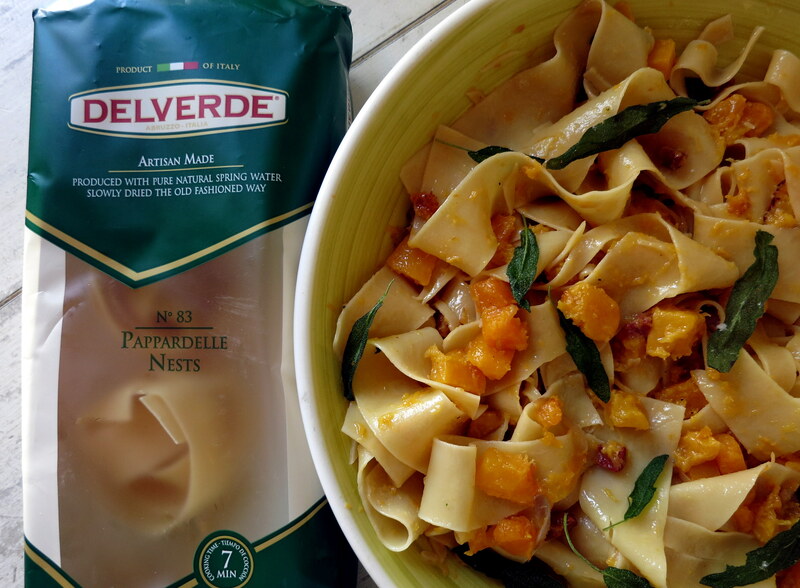 When the pasta water reaches a boil, cook the Delverde Pappardelle Nests for 5 minutes (two minutes less than indicated by the package instructions as you’ll finish cooking the pasta “in padella” – in the pan – along with the sauce). Drain, reserving one cup of the cooking water. To the skillet, add the pasta and reserved cooking water and cook over moderate heat, tossing gently, until the sauce is thickened and the pasta is al dente, about 1-2 minutes; season with salt and freshly ground black pepper to taste. Turn off the heat, stir in the mascarpone and gently toss until it is incorporated throughout. 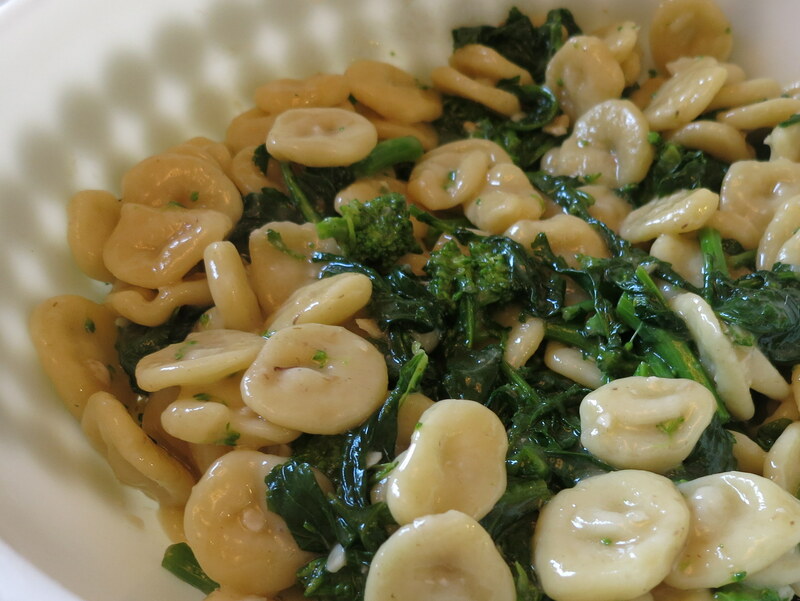 Transfer the pasta to a serving bowl or to individual bowls and top with the crispy sage leaves. Serve the pasta with grated Parmigiano-Reggiano. Buon appetito! This recipe is posted as an entry in the Delverde DISH YOUR BLOG recipe contest to try to win a trip to NYC. Some entrants may have received free sample products in addition to the opportunity to compete for the prize. After nearly six weeks (and just as many pounds gained) in Abruzzo, I’m back home in New York. Each time I leave Italy (something I detest), I feel as if I’ve left behind a little bit more of my soul (the dramatic nature of this statement is not lost on me). I gaze out my kitchen window into my yard and squint hard, as if this action will materialize the Majella’s peaks right here in Queens, NY (more hyperbole). 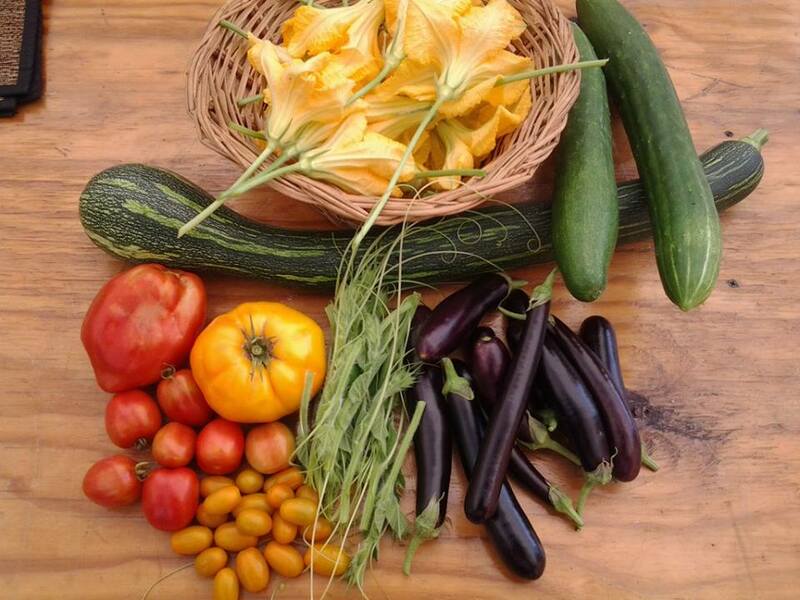 Know where my food comes from – One of the very best meals I prepared in Italy was a simple summer minestra. There was nothing particularly revalatory about this dish. Its beauty lay in the fact that I could trace the origins of each and every single ingredient: red garlic from Sulmona, onions, potatoes and chicory from the pastora (shepherdess) in Salle Vecchio, chick peas from Abbateggio, olive oil from Tocco da Casauria, crusty bread from Sant’Eufemia a Maiella. Although “local” is not yet the norm in the States as it is in Italy, more and more farmers’ markets and specialty food stores are demonstrating an increased commitment to offering local products. Now that all three of my kids will be in school full-time (can you hear the angels singing? ), I’m planning a weekly date with the farmers! 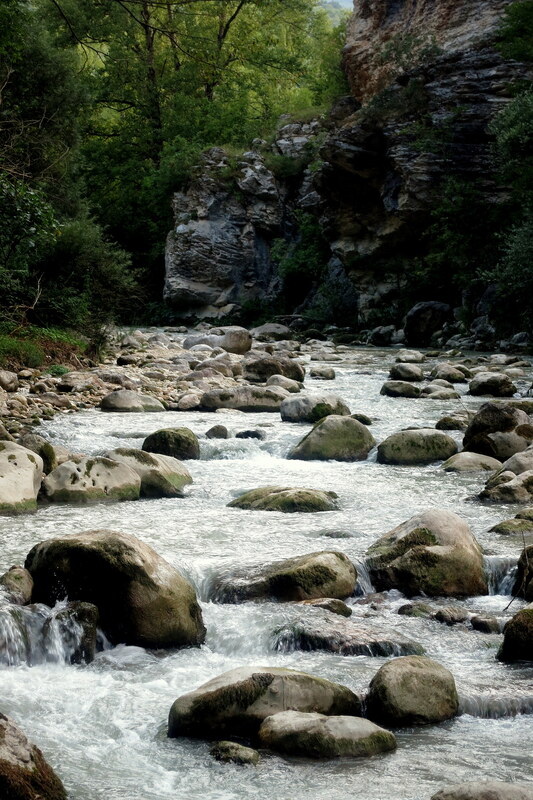 Embrace simple pleasures – When we stay in Abruzzo, we feel as if we live there. We clean the house, tend to mundane chores, try to keep our boys from hanging from the chandeliers, and struggle to work from home just as we do in New York. However, the laidback pace and serene landscape lend themselves to the enjoyment of simple everyday pleasures. A midmorning espresso. A glass of wine with lunch. A friendly exchange with unknown neighbors. 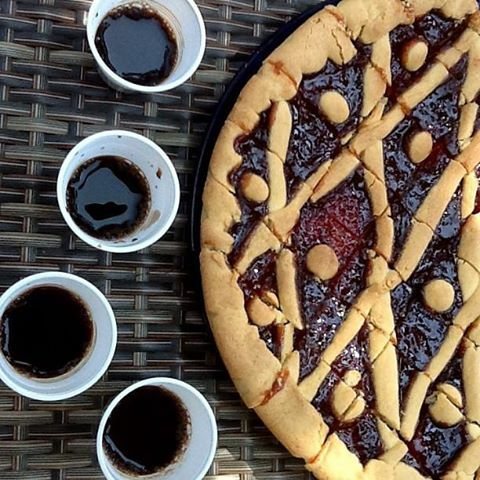 Merenda with friends. An evening passeggiata. 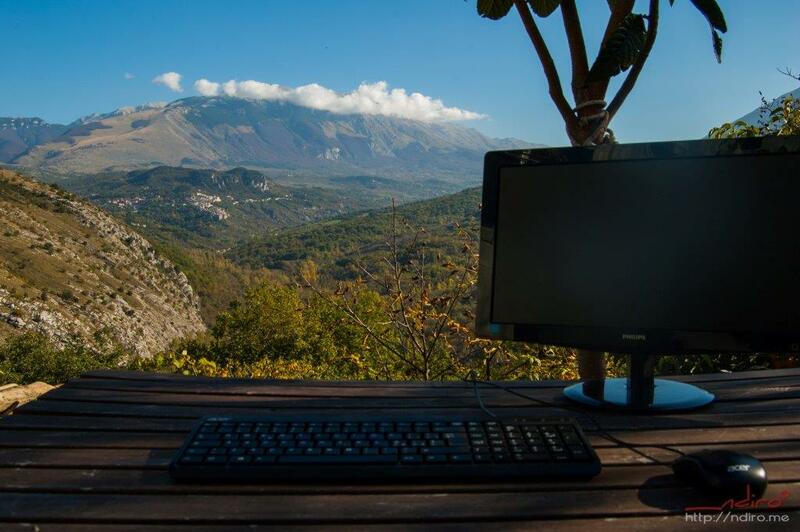 Real life is not vacation, but making time for even one of these simple rituals each day may help me stay in an Abruzzo state of mind. My heart was racing as we hiked down the steep, overgrown trail to the Fiume Orta from our home in Salle, but look what awaited me. 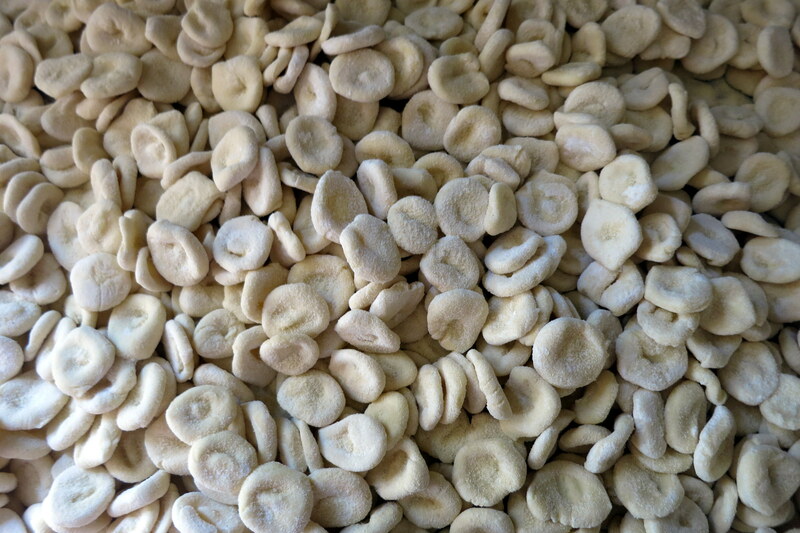 Bring home precious little bits of Abruzzo – On my dining room table you can presently find the contents of two large suitcases filled with artisanal pasta, oil, grains, legumes, honey, jam and spices from Abruzzo. 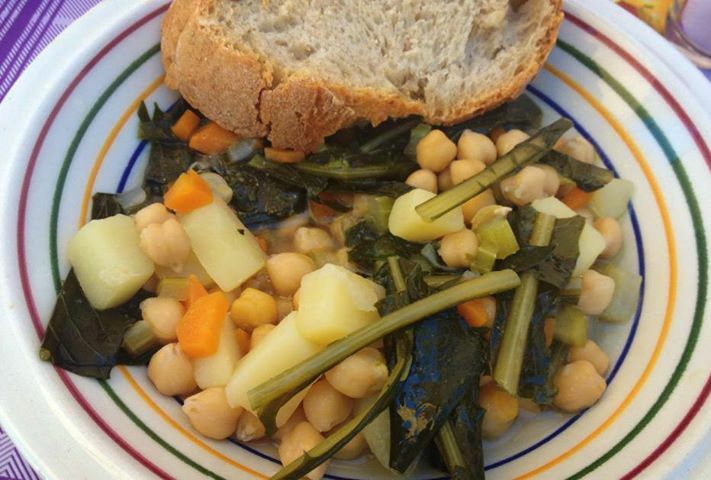 Here’s recipe in which I use dried chick peas cultivated at Agriturismo Pietrantica in the peaceful mountain village of Decontra. 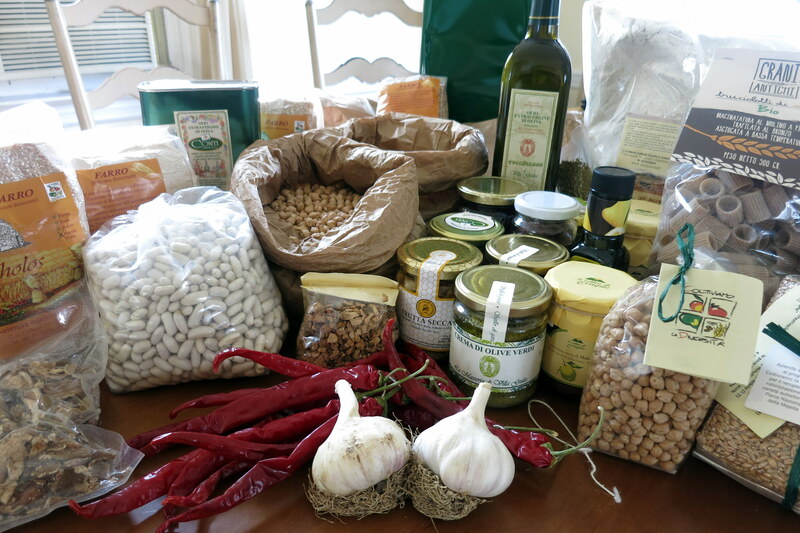 Although these aren’t available in the US, my friends at Gustiamo sell wonderful imported chick peas from Umbria. Buon appetito! This is not a brothy minestra so go ahead and showcase your fresh vegetables without feeling as if you’re eating a steaming bowl of soup in the dead of summer! Rinse the chick peas with cold water and place them in a heavy-bottomed stainless steel, cast-iron or clay pot. 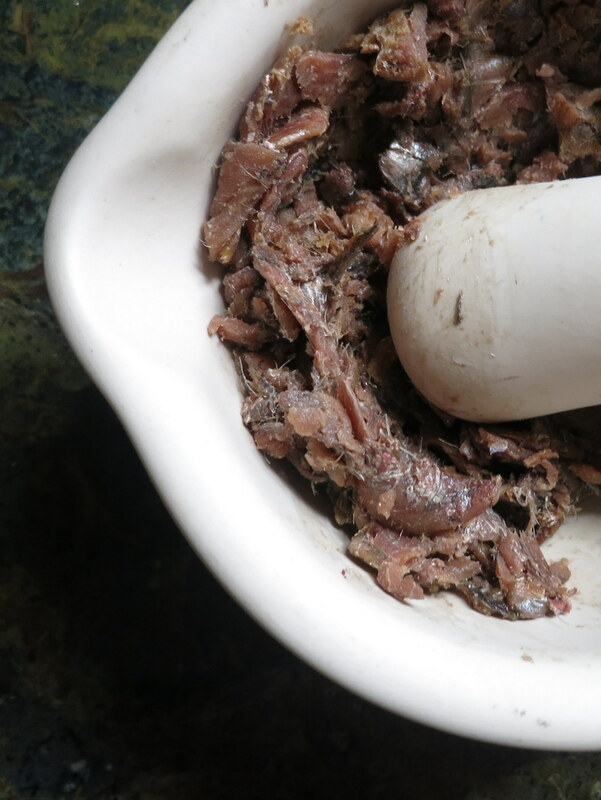 Add water to cover by an inch and allow them to soak overnight, but preferably for at least 24 hours. To a heavy-bottomed stainless steel, cast-iron or clay pot, add two tablespoons of olive oil over medium heat until shimmering. Add the garlic, onion, celery, carrot, one teaspoon of salt and several grindings of black pepper, lower the heat to medium low and saute, stirring often until the vegetables begin to soften and caramelize, about 6-8 minutes. Add 6 cups of water, raise the heat to high and bring to a boil. Add the potatoes and chick peas, reduce the heat to medium low and for 10 minutes. Add the chicory or other greens and cook for an additional 5-10 minutes, until the potatoes are tender and the chicory is cooked through. Remove from the heat and drizzle the remaining two tablespoons of olive oil. 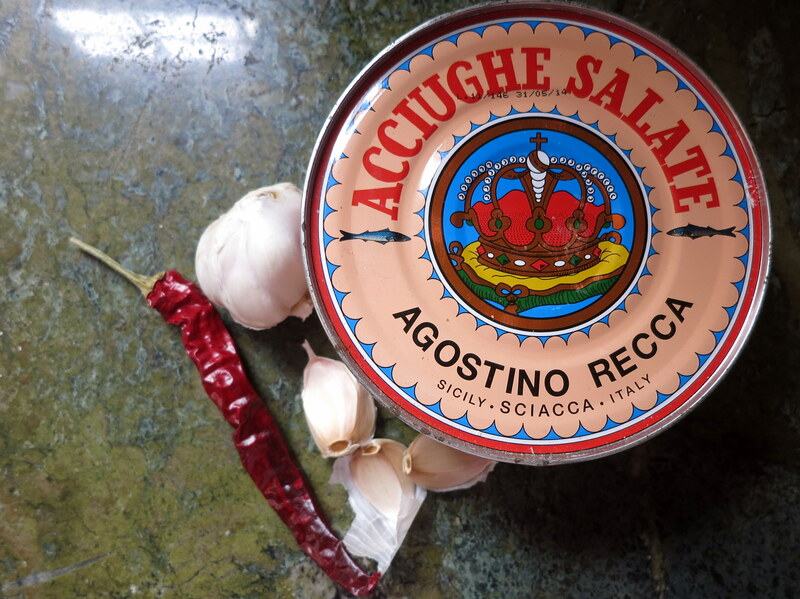 Season with salt and pepper to taste and serve with crusty bread and grated Parmigiano-Reggiano or Pecorino cheese. Buon appetito! To make this dish heartier, add some fresh Italian sauaage. Prior to sauteing the vegetables, remove the meat from the casing, add a tablespoon of oil to the pot over medium heat and saute until browned, stirring often and breaking it up with the back of a wooden spoon — thus “crumbling.” Remove it from the heat with a slotted spoon and reserve. Add an additional tablespoon of oil to the pot and proceed as directed above. Domani si parte! We’re flying out tomorrow and will spend the next five weeks in Italy. This summer trip is particularly exciting for me as it is my first as a food blogger. I’ll roam around Firenze for a few days in search of the best pappa al pomodoro and then head down to Abruzzo for innumerable culinary adventures, among them: a class in seafood cookery on a trabocco in the Adriatic town of Vasto; a food walking tour in the medieval village of Guardiagrele; visits to farms and artisanal producers of typical prodotti abruzzesi; a day-trip to the unspoiled Tremiti islands; and last, but not least, my very first cooking class in Italy alongside two special friends and collaborators. So if you find yourself in or around Abruzzo or have friends or relatives visiting or living in the area, I invite you to join us on Saturday, July 20th for a day of Abruzzo Country Cooking. P.S. – I’ll post photos on Facebook frequently so if you haven’t done so already, go ahead and “Like” my page. Ciao! The ethnic composition of many Americans resembles a patchwork quilt – I have friends whose children are Colombian and Algerian; Korean, German and Welsh; Dominican, Cuban and Irish. They have (mostly) affectionate anecdotes about the clash of cultures and the challenges of adapting to the customs of the families into which they married. 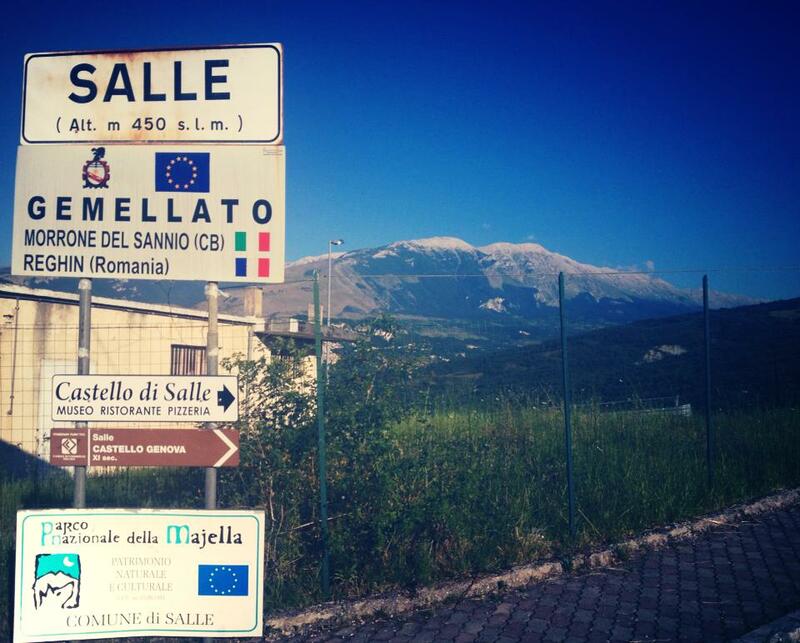 When I was growing up, my home wasn’t a battlefield of countries, but of Italian regions. My Abruzzese father and Siciliana mother immigrated to the US with their respective families and met in Astoria, Queens in the early 1970s. 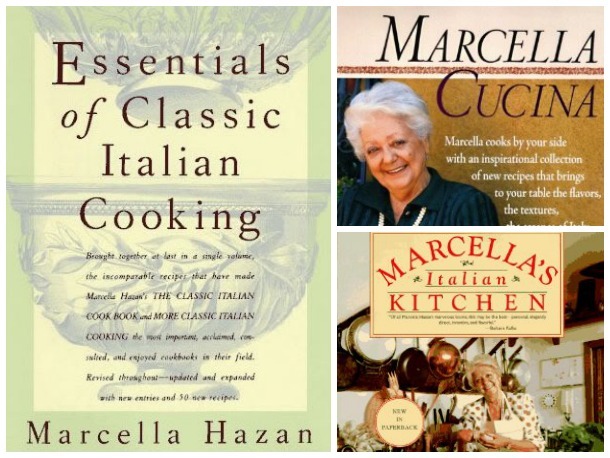 When they married and had me, I benefited from exposure to the rich traditions of both regions and was fortunate to have learned from them true Italian rather than dialect. On the flip side, my parents were fiercely proud – and more than occasionally competitive – of where they came from. 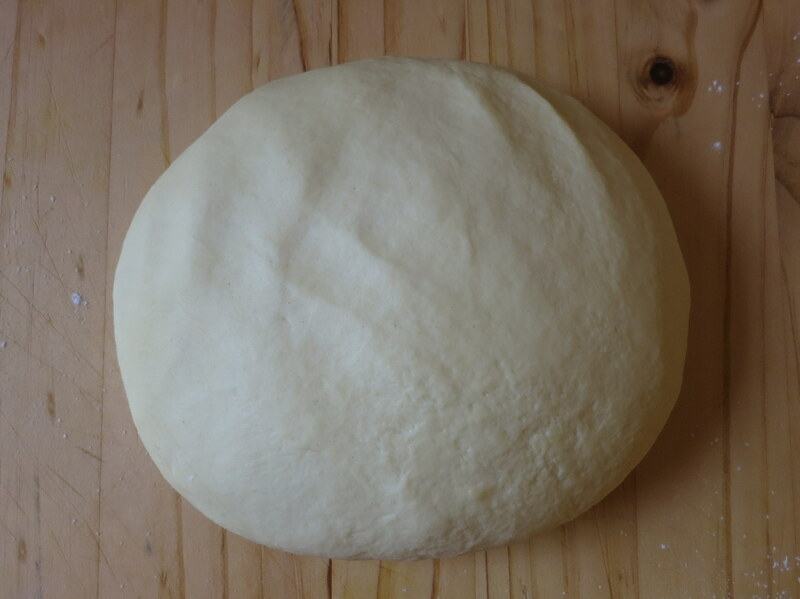 After an argument, they’d mutter politically incorrect stereotypes under their breaths and disparage each other’s dialects (Abruzzese was declared “rough” and Sicilian “un-Italian”). Even now, after nearly 50 years of living outside of Italy and 40 years of marriage, they still instinctively side with their own. Just last month, when I purchased a few good bottles of Italian olive oil and conducted a little taste-testing, the stuff barely made it to their lips before each proclaimed the oil from his and her respective region the winner. 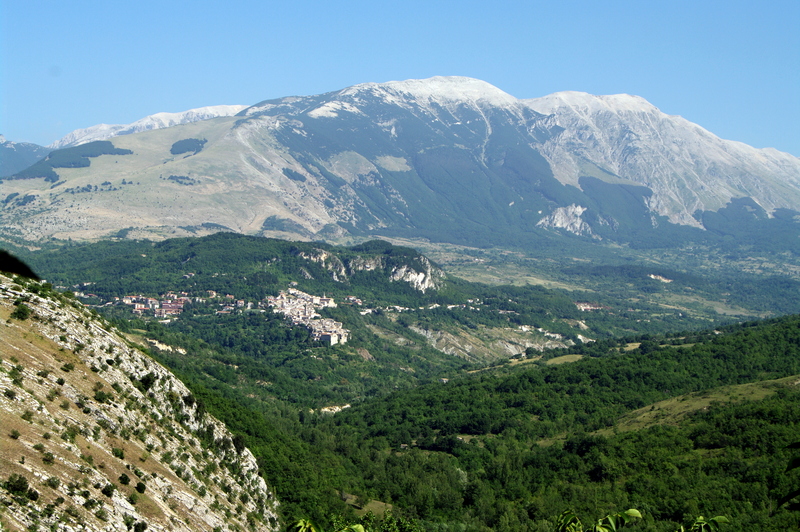 Because my family has a house in my dad’s village, I’ve spent a lot more time in Abruzzo than I have in Sicily. Although she’d never admit it, I know it ever-so-slightly irritates my mom that my days are now spent with La Majella on the brain at every pass. 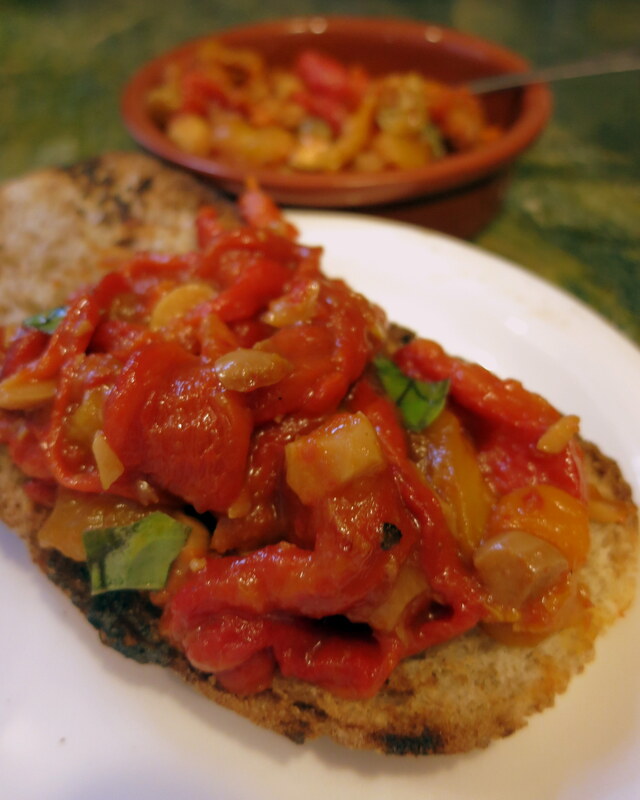 I can sense it in her subtle suggestions of Sicilian dishes for my catering menus and in her overly-enthusiastic praise of my caponata (a dish my father, of course, deems “troppo dolce” – too sweet). My parents’ regional tensions somehow followed me to the Let’s Blog Abruzzo conference earlier this month. 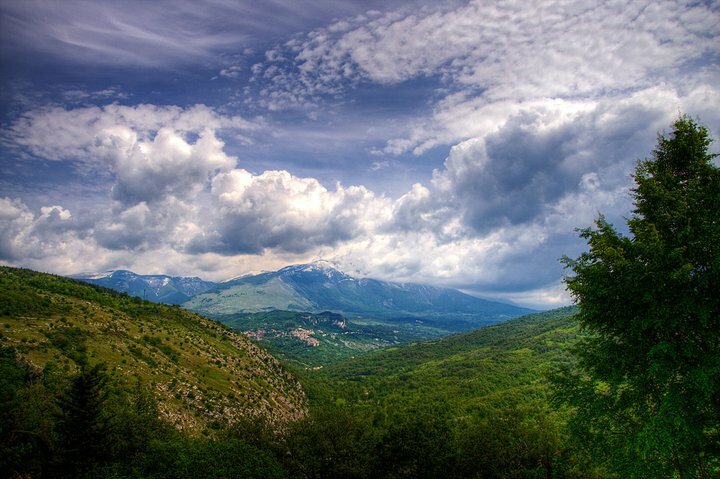 In a village perched high in the mountains of Abruzzo, after telling a new acquaintance where my parents were born, she nodded knowingly in response, and said, “Ah, si, sembri molto Siciliana” – “Yes, you seem very Sicilian.” I could literally feel my mother’s beam of smug satisfaction projecting across the Atlantic (and when I posted the woman’s observation to my mom’s Facebook wall, my dad commented in reply, “E’ impossibile” – “It’s impossible”). The very next day, while enjoying a quintessentially Abruzzese lunch of timballo and arrosticini with the brilliant and charming journalist, Judith Harris, I found myself jotting down Judith’s beautiful recipe for mandorlata di peperoni, a Sicilian chutney of sweet peppers and almonds. 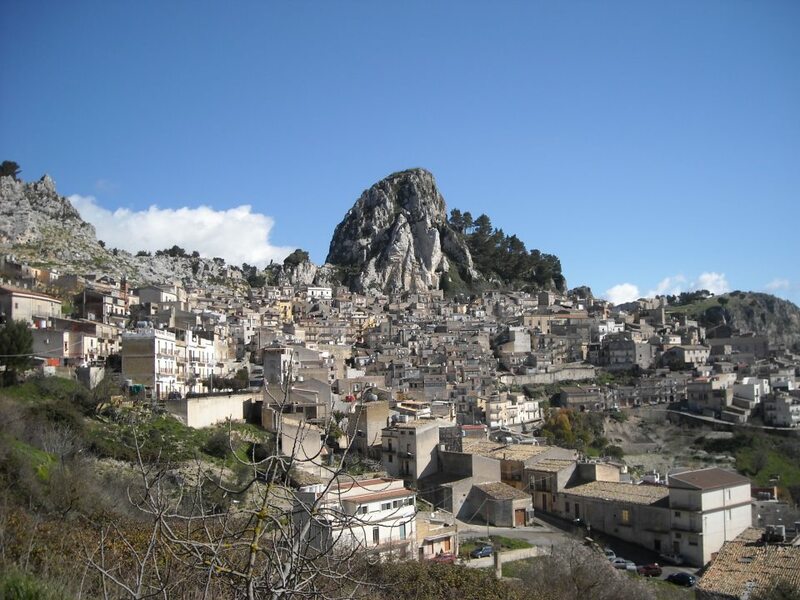 So just as mothers have a way of following you wherever you go, Sicily – and by association, my mother – found me in Abruzzo. I know how desperately she wishes my grandfather had never sold her family’s parcel of land that was blanketed in olive, almond and apricot trees and I, too, wish we had a family home in Sicily like we do in Abruzzo. I haven’t been to Sicily during my adult life and lately, I feel as if my mother’s native island is calling me to come and discover my other half. Hopefully, my mom and I will take a trip together next spring, but for now, I’ll have to settle for this Sicilian mandorlata di peperoni, which somehow made its way to me via Abruzzo. Preheat a broiler or light a grill. Place the peppers, skin and stems left intact, on a baking sheet lined with aluminum foil. Roast or grill, turning occasionally, until the peppers are shriveled and their skins are completely blackened and charred. Remove the peppers to a paper bag and seal the bag until the peppers cool. Peel and clean the peppers, discarding the skins, seeds, stems, and inner white membranes. Cut the cleaned peppers into ½ inch strips. 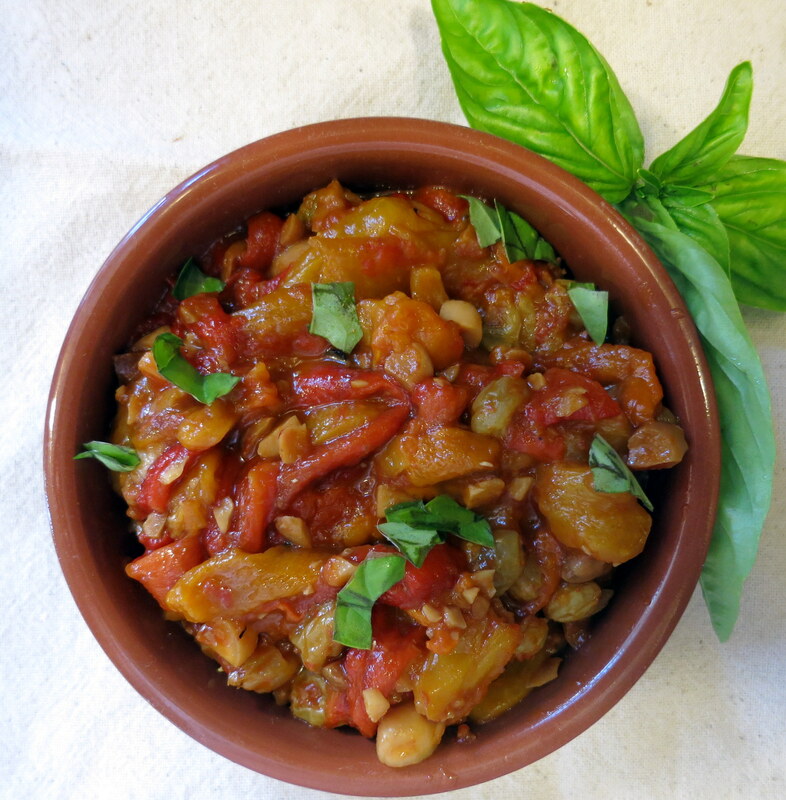 To a saucepan, add the peppers, almonds, sugar, vinegar, salt, tomato sauce and raisins. Turn the heat to medium-low, and allow to simmer, stirring frequently, until the sauce and vinegar have evaporated, about 5-7 minutes. Remove to a glass or ceramic bowl and allow them to cool. Cover and let the peppers sit for at least 8 hours, or overnight in the refrigerator, so that the flavors meld together. Return to room temperature prior to serving. 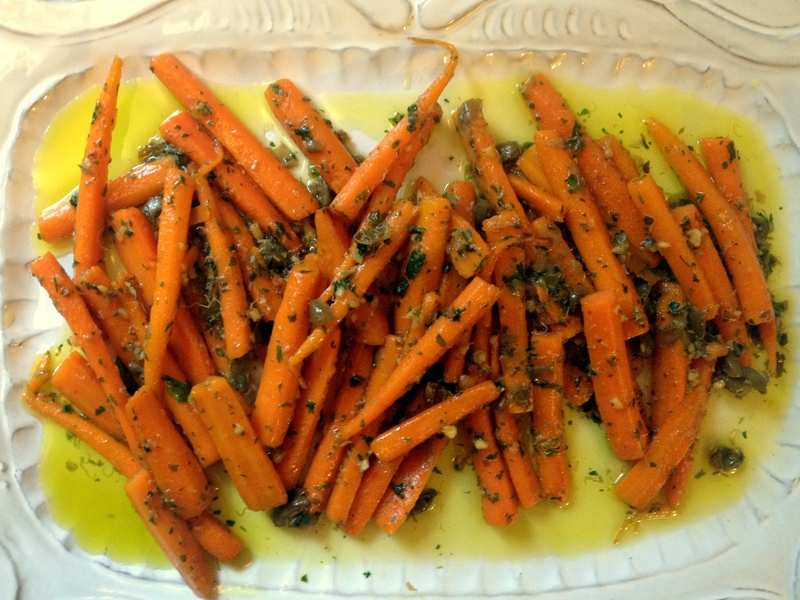 Garnish with torn basil and a drizzle of good olive oil and serve with crusty bread. Buon appetito!